BeautyFruityBlurbs: Quick Fix: Winter Ball Dress Woes! Quick Fix: Winter Ball Dress Woes! The annual 'Winter Ball' is tomorrow night, and I've had a bit of a disaster - I left everything to last minute, and only realised on Wednesday that I'm in a bit of a dress situation. Anyhow, I rushed my dress to the tailor the same day, as I'm revamping a dress that I've been wanting to wear for a while - but I get it back Saturday afternoon, so if things do not work out I'm in a bit of a fix. Considering nothing is easy access over here and you pretty much have to plan in advance for everything - which is what I usually do, especially when it comes to clothes - however, my schedule just did not allow it this time. So, I was thinking, there must be a few more of you out there in a similar situation? Here's a little list of some pretty dresses (and one jumpsuit) I've put together. Most are available on Labels and the Labelsestore (God bless the Labels estore for last minute fixes!!!!!!!) - the others at Misha Lakhani's boutique (either in the same colours shown below or different colour variations) - considering they are in stock of course and haven't been sold out. 1. Misha Lakhani - available at the Misha Lakhani boutique on 26th street in different colour variations. 2. Misha Lakhani - available at the Misha Lakhani boutique on 26th street in different colour variations. 3. Maheen Karim Jumpsuit - available on the Labels estore with an urgent delivery option. Click here. 4. Maheen Karim Metallic Dress - available on the Labels estore with an urgent delivery option. Click here. 5. Ayesha F. Hashwani Kaftan dress - available on the Labels estore with an urgent delivery option. Click here. Alternately, you can even pop by to Labels and purchase these pieces in-store. Do you have any other ideas? Are you in a bit of a situation as well? and what are you wearing to the ball? 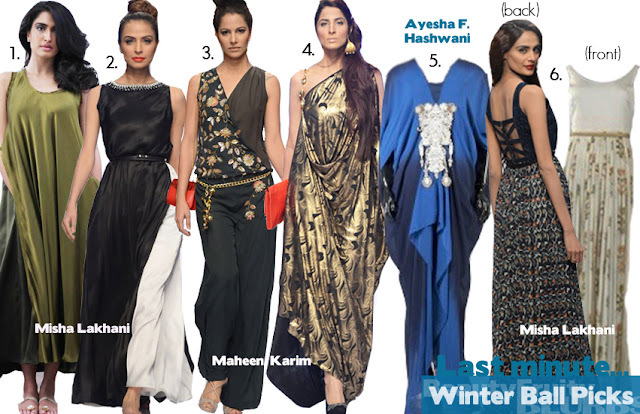 I love the jumpsuit but its so last year.Ayesha F. Hashwani Kaftan dress is soo safe.Misha Lakhan's Tiffany dress seems doable.